As you can probably tell, today’s post isn’t a review, recipe or personal blog. It’s actually about something a bit closer to my heart. I’ve always felt really passionate about empowering people with the knowledge they need to make healthier food choices and decisions regarding their diet, it’s one of the reasons I’m now studying nutrition. It can be really hard for people who want to eat better, but simply don’t have the resources or just don’t know how. The term “healthy” has become really popular in the last few years with more people than ever turning to organic, vegetarian or vegan options and using their local health food shop instead of their local supermarket. Personally, I think it’s because packaging can be so misleading and the food (particularly the meat) industry is in such a mess. Advertising bombards us with claims like: ‘low fat’, ‘no fat’, ‘healthy’, ‘reduced sugar’, ‘no added sugar’, or ‘no added salt’ and it can be difficult to work out what is actually good for you. 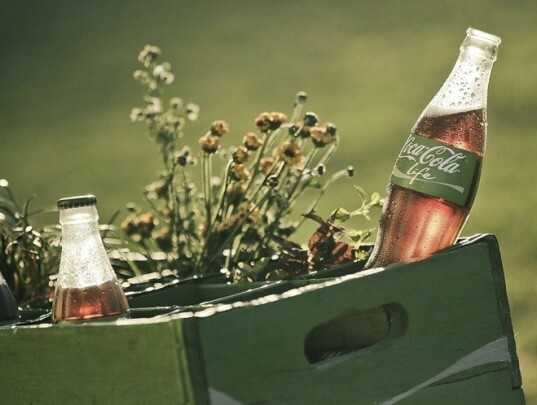 A coca cola bottle, poking out of a green crate, in a green field surrounded by flowers/plants. The colour green has so many connotations with natural, healthy, eco-friendly type things. So to the public, it’s sending the message that this ‘new’ product that they have brought out is somehow good for you. Now don’t get me wrong, this product is slightly better for you than normal coke – given that it doesn’t have added sugar and uses stevia instead – but it still contains just as many additives, preservatives, chemicals and flavourings as it usually does. Coca Cola argues that they have used the colour green because it represents the leaves of the stevia plant. You can read another article here about it’s advertising and here is another article about stevia and it’s safety in food because there are some arguments about that too. It was banned for use in food in 1991 as early studies showed that it may cause cancer. However, several companies argued that it should be classified in the same class as some of the other artificial sweeteners – known as GRAS – Generally Recognised As Safe. In my personal opinion I don’t think there should really be this category for food that is going to be mass produced and sold to the public but there you go… If you are really into the science of stevia and its safety here is a study by the University of California. Ok I declare this here rant over but I find it frustrating when advertising of certain foods is misleading. People aren’t stupid and I don’t think it will be that popular. I suspect that Coca Cola will rebrand back to its traditional red colour in a year or two.. What’s your opinion? Do you find it hard to know what to eat? Do you have doubts in the food industry and the flavourings/preservatives/chemicals used in processing food? Note: Ok after I got this rant out of my system I did reflect back on it. It’s really good to see companies taking a role in combatting the obesity crisis and helping people to lower their intake of calories. Coca Cola, Pepsi and Dr Pepper Snapple Group have made a pledge to cut the number of calories that American’s consume by 20% by 2025. They’ll do this by bringing out new products like Coca Cola Life and Pepsi True as well as marketing and packaging their products differently. I think the issue that I had was more to do with the advertising of CC Life and the particular advert that I saw. I had a bottle of coke the other day – but I am not under the impression that it was in any way good for me – and I think this is what made me mad *INSERT GRIZZLY BEAR EMILY FACE HERE*. In America’s low income families, sugary fizzy drinks may account for a half or more of the calories a child consumes each day and sugary soft drinks account for about 6 percent of the average consumer’s daily calories. By having the companies on side, and aiming to change this.. Well it has to be a good thing. As far as the use of stevia goes, later research did not find it to be cancer-causing as suggested by the earlier studies but there is still a lack of research into long-term effects on human health. Sometimes you just need some Chicken Nuggets.